Prowler offers replacement undercarriage parts for mini excavators, compact track loaders and carrier crawlers. We stock industry leading drive sprockets, track rollers and idlers. Quality undercarriage components are essential in preventing premature wear and damage to your Replacement Rubber Tracks. 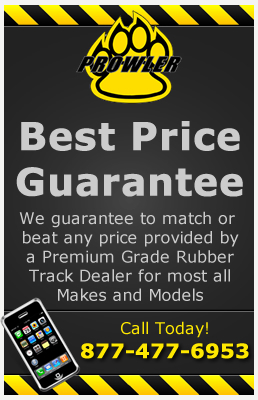 Worn undercarriage is one of the leading causes of premature track wear and failure. It is very important to inspect and replace your worn undercarriage when buying replacement rubber tracks for your mini excavators and compact track loaders. Give us a call to learn more. We can help you understand how to recognize undercarriage wear and possibly review photos of your undercarriage parts to help determine problem areas. In order to prevent premature wear and damage to your new rubber tracks, always inspect and replace your worn undercarriage as necessary. Poor undercarriage, specifically drive sprockets, is the leading contributor to premature wear and track failure. Give us a call to learn more. Made of the highest quality materials, Prowler Heavy Duty Sprockets can easily handle the punishment of everyday operations. Manufactured to OEM specifications, you can be assured that your new Sprocket will fit perfectly and provided equal or extended service over the original part. 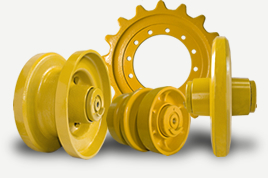 We have hundreds of single, double and triple flange rollers for excavators and track loaders. Maintenance free Prowler heavy duty rollers are completely sealed to prevent dirt or small debris from entering and damaging the internal components. Prowler replacement rollers are manufactured with the highest quality materials, providing you with long term worry free operation. Prowler’s heavy duty Front and Rear Idler Wheel assemblies for both Mini Excavators and Track Loaders are built to handle tough applications. Only the finest materials and manufacturing techniques are used to meet or exceed production standards. We have hundreds of aftermarket Idlers in stock to fit nearly all compact construction equipment including Bobcat, Case, CTA, Gehl, New Holland, Takeuchi and many others. We have hundreds of single, double and triple flange mini excavator rollers and track loader rollers in stock. Prowler heavy duty rollers are completely sealed to prevent dirt or small debris from entering and damaging the internal components. Prowler replacement rollers are manufactured only with the highest quality materials, providing you with long continuous operation without the worry or need to replace them. All Prowler replacement rollers for mini excavators, compact track loaders and crawlers are maintenance free. Looking for replacement front idlers and rear idlers for your track loader or mini excavator? 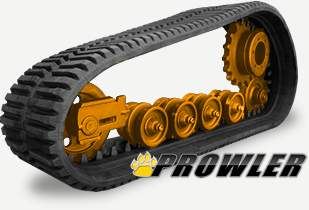 Prowler’s heavy duty front idlers and rear idlers for compact construction equipment are built to handle the worst applications, buy utilizing only the finest materials and manufacturing techniques that meet or exceed production standards. We always have hundreds of replacement idlers in stock that fit nearly all compact construction equipment such as Bobcat, Case, Gehl, New Holland, Takeuchi and many more.